I do love it when writers try to concoct reasons for characters from different fictional universes to beat the snot out of each other. The new story trailer for Marvel vs. Capcom Infinite hasn’t let me down, as it’s delightfully ludicrous and yet entirely in keeping with other crossover events. Enjoy battering your mates? Here are the best multiplayer games on PC. 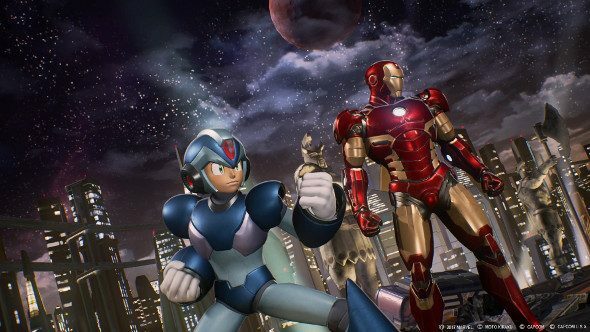 Ok, so here’s the skinny: Ultron Sigma (one-part Ant-Man’s evil robot – or Iron Man’s if you’re going by the movies – and one-part Mega Man villain) has got his robotic claws on two of the infamous Infinity Stones, and he’s used their power to combine the Marvel and Capcom universes, like you do. Meanwhile, Darkstalker’s Jedah has, with the help of other ne’er-do-wells, created a Symbiote beast. Think Venom, but more grouchy. What’s a hero to do? Typically, they do something very silly and free Thanos so he can help them get the remaining stones. Why wouldn’t you enlist the help of a purple dude who’s sometimes known as the Mad Titan? Judging by the trailer, however, not everyone is down with the whole recruiting a supervillain with an obsession with death. Captain America wants to use him, but Iron Man has other ideas. The plot seems to be borrowing a great deal from the Marvel Cinematic Universe, combining Avengers: Age of Ultron, Captain America: Civil War, and Avengers: Infinity War, with plenty of nods to other films and comic events. It’s dumb and I love it. It doesn’t seem to be drawing quite as much from Capcom’s disparate franchises, though I did love seeing Mega Man’s Doctor Light giving a very serious briefing to Iron Man and chums. Marvel vs. Capcom: Infinite is due out on September 19.